Commenting on the evolution of identity and the desire amongst many individuals to change their bodies, The Salon invites viewers to become participants in an immersive installation, escaping from reality and into a cyber landscape based on western ideals. 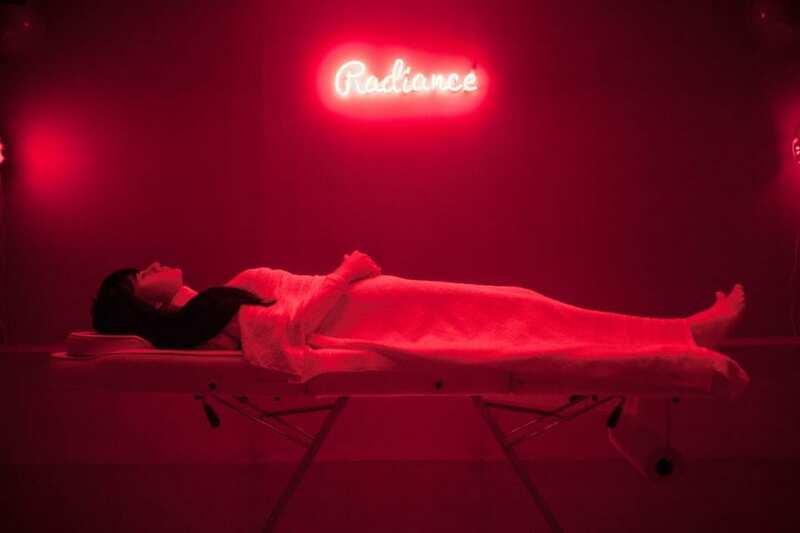 Juno Calypso’s contemporary examination of femininity outlines the dangers of the beauty industry, working with repetitive iconography, the act of masking the face (seemingly a point of identification) and using various shades of pink often associated with women and gender-specific marketing. Teaming up with Geriko, the creative duo shortlisted at Aesthetica Short Film Festival 2017, a combination of futuristic video and live-action performance merge within the confines of Galeria Melissa, London. 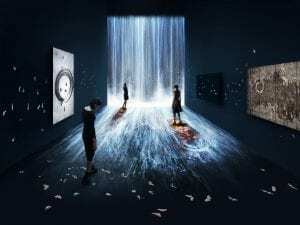 The filmmaker’s opening introduction harks back to science-fiction cult classics, mimicking a rigid style and adopting illuminated lines and the popularity of space-age material – chrome. Elements of a conventional beauty parlour are seen within the animation as a two-toned tile floor spreads across the expanse of the room with various reclined chairs positioned in two facing booths. Within, anonymous figures receive treatments from equally ominous twins, showcasing the eternal desire for personal investment through self-love and rejuvenation. Outlines of posed women act as wallpaper for the tall walls of the three-dimensional world. The duo’s creative style is most prominent here as the graphic tropes of Japanese manga are displayed, yet the overwhelming pink colour scheme, signifies their aim to “achieve a collision between the universes [of the two artists], by the evocation of bodily rituals and the quest for eternal beauty”, as Geriko express. Moving into the second section of the show, a cast of Calypso, a transformative figure who appears in much of her past work, once again takes centre-stage, lying, motionless on a central trolley-like bed. 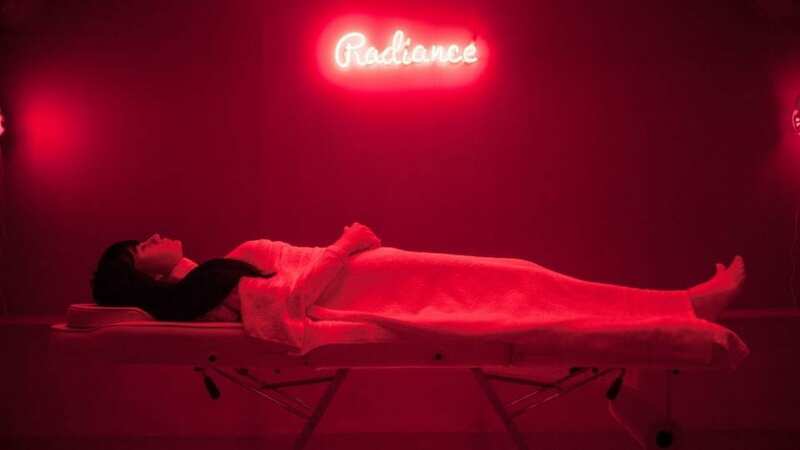 Here, the artist comments upon the life-long journey to accomplish the intangible state of “radiance”, a word inscribed in neon on the wall behind the body. Further faceless mannequins are positioned around the room, wearing identical material commodities including shoes from Melissa’s SS18 Mapping collection. Here, “the notion of eternal beauty becomes a nightmarish cycle; a glitch” as the room resists the contrastingly rosy tones previously exploited, flooded instead with a deep, hazardous red. 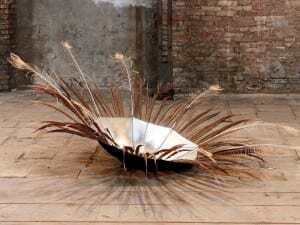 The Salon is at Galeria Melissa, London, 15 February-15 April. Find out more here. 1. Installation view, Juno Calypso, The Salon. Courtesy of Galeria Melissa. The practice of Abraham Cruzvillegas draws on his experiences of growing up in Mexico city, as he creates sculptures that grow from their environment.